Master Audio is now live on the Unity 3D Asset Store! This package is all you need to fulfill your extensive audio needs. Superb performance for mobile games, and just as useful for other platforms, as well. 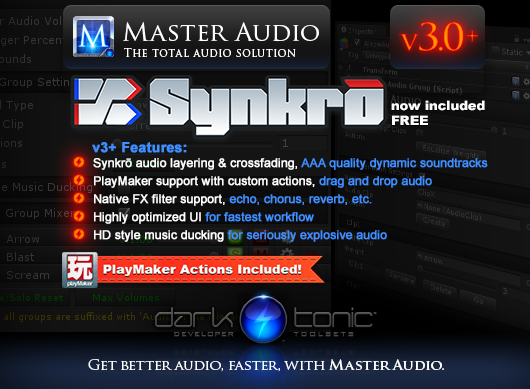 Now includes a slider for adjusting the volume of all sounds triggered by MasterAudio. Contact us for student and bulk discounts! Setup is a snap and you will never need to write more than the occasional line of simple code to use this. Email us any new feature requests, as well! Master Audio was used with great success in "Wall Street Titan", an Indie Game Magazine "Best of 2012" iOS title released in October 2012. Enjoy! Grab it on the Unity asset store now!